The 2-car diesel set of 401 and 500 class trailer sit at the terminating platform at the end of the branchline from Weelabarrabak. Weelabarrabak, which is Aboriginal for "bloody hard place to find", is a fictitious town located on the NSW rail system. Although it is a fictitious location, our aim has been to create a fairly typical NSW country town, complete with station, main street, shops, local industry, and outlying farming districts. A double track mainline runs through this busy region of the NSW system. Weelabarrabak has its own locomotive depot, and has many local industries served by rail, thus keeping the local or 'pick-up' goods quite busy. Most times there is a permanent shunting engine assigned to the yard. There is also a relief road or run-around track for each of the Up and Down tracks. No particular era is represented, with the trains being typical of those from the late steam era through to the present day. Railway traffic consists mainly of NSW Government rolling stock. Being a part of a busy mainline also means interstate traffic can be seen, and quite often a steam-hauled tour train. The locomotives and rolling stock are individually owned by the group members, most being scratchbuilt, kit-built or kit-bashed. The layout consists of 8 separate modules - 4 straights and 4 corners. The framework is 12 and 17mm plywood resting on aluminium 'A'-frame legs. Scenery is hardshell plaster over a combination of expanded foam and fly-wire mesh with scatter materials - grasses, etc - glued on top. Track is Peco code 100. Buildings are mostly scratchbuilt, with some kit-built and kit-bashed. The bridges are all scratchbuilt. The layout is operated by home-made controllers. There is a separate controller for each of the mainline tracks, and a third controller for the sidings. This allows for continuous operation of the double track mainline with provision for independent shunting. A custom made diode matrix system operates the 13 track storage yard at the rear. All of the turnout motors and the electromagnet uncouplers are hand-made. 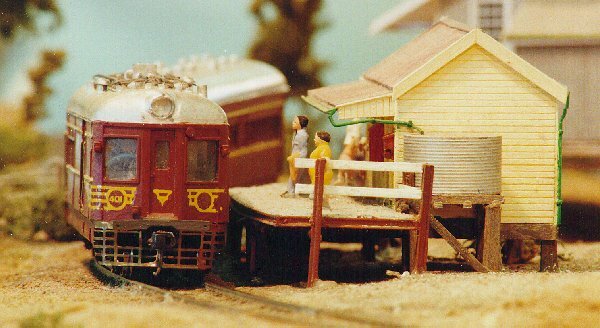 Weelabarrabak was exhibited from 1993 to 2000, before being dismantled in order to construct our next layout, Moss Vale.